Last week I went to a presentation by Liz Edmunds (aka the Food Nanny); which really inspired me–about dinner! She advocates making a 2 week plan (Ali, I thought you’d like that with your 2 week shopping trips.) To make making that plan easier, Liz suggests setting a theme for each night of the week. I love this idea, I think it will help with my dinner problem–falling into a rut and rotating a handful of recipes. Here is my little meal plan to fill out. I bought her cookbook because I am always interested in easy recipes. I have done weekly menus for a while and one little trick I’ve learned is to just save those menus in a file to look back through when I get stumped. I’ll let you know how it goes next week. I plan on doing some tweeking as I go; but I figured I’d share–anything to make dinner easier, right? We were always excited to head over to Woodburn, OR for Oktoberfest when I lived at home. Although beer certainly is the centerpiece of the festival, there is a lot to see and eat at these carnivals. Oktoberfest is arguably the largest festival in the world, hosting well over 6 million people in the actual fair in Munich last year. It was first held to honor the newly married Crown Prince Ludwig I and Therese of Bavaria in 1810. Celebrations run from late September to the first Sunday of October and chances are there is a festival being held in a city or town near you. 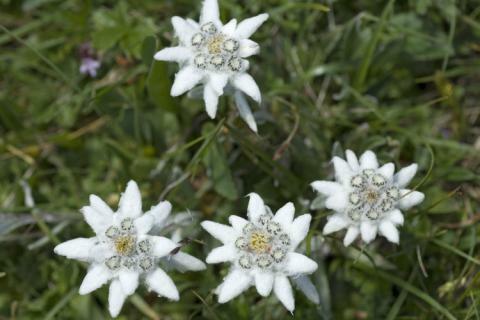 However, if you’d like to celebrate at home, I suggest having a german inspired dinner, possibly trying out a traditional game of skittles, and making these Edelweiss hats to wear for the party. *For paper, use a hole punch to make 6 circles or do one larger circle. You can also use 6 yellow pompoms or beads for the center. 2. 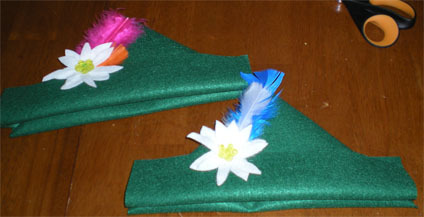 Fold both top corners in towards the middle evenly, leaving 2-3 inch border along the bottom. If you are using felt, you will need to tack the corners down with a bead of glue. 3. Fold the bottom up on both sides each to their own side. This forms the brim. 4. Cut out an edelwiess flower. (Here’s the pattern I used:) If you are using paper, use a hole punch to make 5 yellow circles and glue all together. 5. 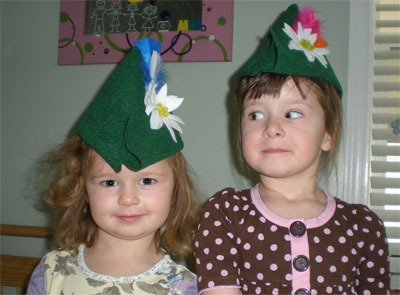 Make a small puddle of glue on one side of the hat and lay the bigger flower down to make the base, then put the smaller on top. Next add a puddle in the center of the flower and arrange the circles to form a center. 6. 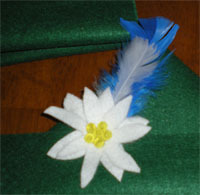 Then tuck (and glue if necessary) the feather behind the flower and feiern!